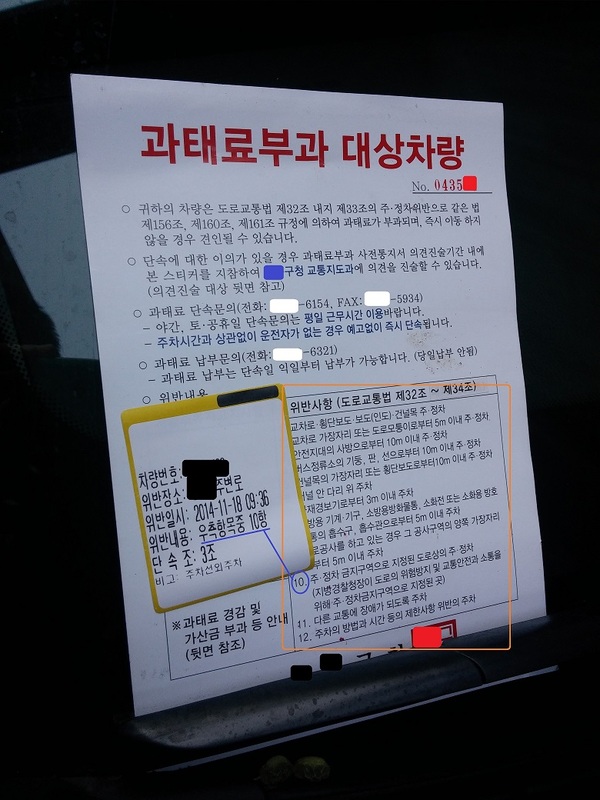 Above is what a (motor vehicle) parking ticket/citation looks like in Korea. Interestingly, Korean parking tickets kindly outline the 12 possible stop/parking violations subject to an administrative fine (과태료). I have used orange (above) to highlight those 12 violations. FYI, the above vehicle violated #10 from that list. 1. Stopping or parking at an intersection, crosswalk, sidewalk, or railroad crossing. 2. Stopping or parking at a place located w/i 5 meters from the edge of an intersection or the corner of a road. 4. Stopping or parking at a place located w/i 10 meters from any pillar, board, or line indicating a bus stop. 5. Stopping or parking at a place located w/i 10 meters from the edge of a railroad crossing or a crosswalk. 6. Parking inside a tunnel or on a bridge. 8. Parking at a place located w/i 5 meters from a place where any fire-extinguishing equipment is located or being kept. 9. Parking at a place located w/i 5 meters from both edges of an area where “road works” are underway. 11. Parking in a manner that hinders regular traffic. 12. Parking in violation of time/manner restrictions, etc. Note 1: Basically, the above is a nice summary of Articles 32-34 of the Road Traffic Act (도로교통법). Note 2: Of course, there are exceptions for certain exigent circumstances and/or emergency vehicles. In Korea, the administrative fine (과태료) for a parking violation is normally KRW 40,000 (USD 36). Unless the driver can be located/found (then and there), the vehicle owner is obligated to pay. The administrative fine can be paid from the next day (of violation). Traffic fines can be accessed and paid via the www.efine.go.kr website too. When a parking violation is spotted, the enforcement officer will normally photograph/record the vehicle (as it’s parked) and slap a ticket/citation on the windshield. If the vehicle is not removed w/i a reasonable period of time, it will be towed. Of course, unreasonable tickets/citations can be challenged. 1. A parking violation, in itself, is not a crime. Meaning, such a violation will not end up on one’s criminal record. What is a crime, however, is the act of “deliberately covering up one’s license plate number.” I recently read that one such person ended up paying a criminal fine (벌금) of KRW 700,000. A fine in the form of “벌금” (as opposed to “과태료”) means that the corresponding violation constitutes a crime. 2. I recently heard in the news that a man in his 40s murdered two of his neighbors (who were sisters) in Bucheon. According to reports, the man was often seen arguing with the sisters over a parking space. The murder seems to be related to the parking issue. In Korea, neighbors most often argue over parking space or “between-floor noise” (i.e., noise travelling between apartment floors). These arguments sometimes get out of hand. 3. Some major cities/districts currently run what is called “Resident Priority Parking” (거주자우선주차). It’s a city/district-run system designed to help ameliorate the parking situation especially in residential areas. Alleys and/or small roads in the neighborhood are offered as parking spaces (first) to its residents for a relatively small fee. You don’t necessarily have to be a “resident,” but priority will be given to them. To apply, try contacting the “facilities management corporation” of your “district” (구 시설관리공단). You can visit (in person) or apply via the internet or fax too.